When you have a large amount of CDs, DVDs and other similar collections, it can be very beneficial to store them in one neat and secure fashion. 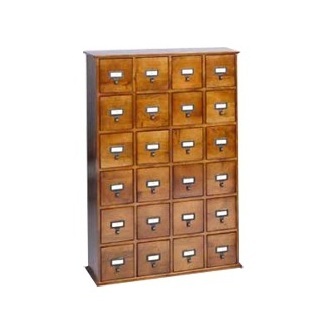 This wooden library-style card file cabinet is an attractive and highly functional storage furniture piece and can be used for multimedia collections or an array of different household objects, perhaps in a hallway, foyer, bedroom or dining room. It’s nicely made and will receive numerous compliments from visitors. The walnut cabinet has 24 pull-out drawers, which altogether can house 456 CDs, 192 DVDs, or 96 VHS tapes. If placed in a home’s entrance area, it can be used for the storage of keys, wallets, letters and other items you might need when entering and exiting the building. The slightly retro librarian’s cabinet will increase decorative quality to an interior space as well as provide excellent storage and neat assembly, which will particularly appeal to those of us who like to keep our collections in tidy order. You can buy it from here: Wooden Library-Style Card File. Old items of furniture long since banished to history can often make a come-back in a different form. This is true of the Apothecary Cabinet which is now mostly purchased as an interior accent furniture piece. Although it is one that can perform a perfectly valuable function along the lines of any type of cupboard or chest of drawers. This Nantucket style white Apothecary Cabinet with blue doors is one that caught my eye when browsing the internet recently. So what exactly is the meaning of Apothecary? It’s an old fashioned word for what we now call a pharmacist (or a chemist). The Apothecary was also a lot more than a mere drugs dispenser, often taking on the role of a midwife, local doctor and even a surgeon. In many ways, they were also pioneers in chemistry and pharmacology, often spending spare moments concocting new drugs and herbal remedies. With origins in the Middle East, one of the first mentions of the term Apothecary was in Geoffrey Chaucer’s ‘Canterbury Tales’ which was written sometime in the latter part of the 14th Century, in England. William Shakespeare also mentions the job title in his famous romantic tragedy Romeo and Juliet. The Apothecary was in this case the drug maker who sold Romeo his poison with which he killed himself. All very sad, I must say. The word is also mentioned in more recent literature, notably William Faulkner’s “A Rose for Emily” written in 1930. The distressed white Apothecary cabinet pictured above is one that the old pharmacists would have had in their stores. However, the cabinet is not quite as it seems. It’s composed of 4 doors, each of which has four square panels on the front. The small center most drawers are each as they appear to be, drawers that open out. There are also two deeper drawers and at the very bottom, two base drawers, which are more obvious and rectangular in shape. You will be able to decipher the different drawers and cupboard doors from a much larger image which can be found here: White Apothecary Cabinet With Blue Doors. It’s an attractive furniture piece which will sit well in a variety of interiors. 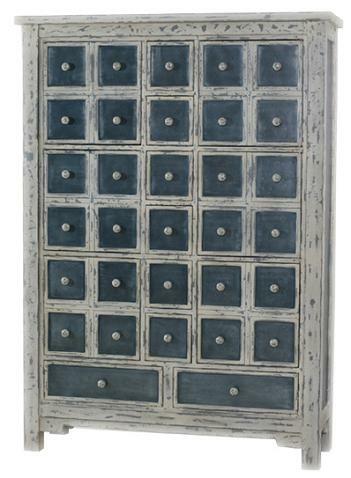 One might think about the Apothecary cabinet as a possible addition to a kitchen, dining room or even a rustic bedroom.